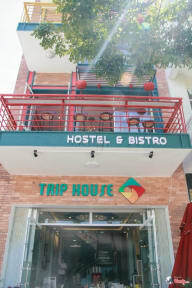 TripHouse Hostel offers Dorm Bed & Private Room. Every rooms has other style & color of Da Nang’s destination. We have Danang color Dorm Room with 12 dorm beds, Hoi An Town private room with 6 dorm beds, 1 twn bed with Son Tra peninsula color, & 3 private double room. Good location: easy to move & best view. We have service: Food at room. A common place on the rooftop, you can read book, enjoy food & drinks & the best view to look at Danang in night. Dorm Bed: 1.2m x 2m, which is fully equipped with air-conditioner, free towel, except shared bathroom com with hairdryer, bathgel and shampoo. Private Room: large-size bed, hairdryer, air-conditioner. 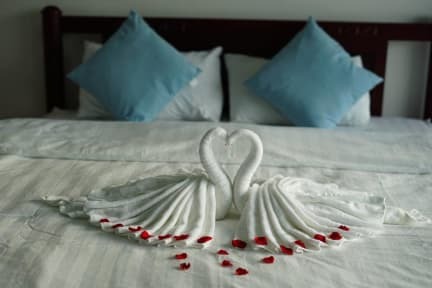 We have room with private bedroom or shared bathroom. We also serve breakfast, lunch & dinner. Nice hostel, friendly, and good position. Staff very friendly and rooms were really spacious and clean. Bathrooms lovely. We even used the kitchen a couple of times but then realised after that we probably were not supposed to as you can order food to your room (but it didn’t say anywhere that it was staff only) but anyway the staff were very nice about it. Nice view of the river from the top floor. Very quiet, peaceful place to relax. When we arrived our room was double booked, they actually upgraded us and charged us less which was great. The hostel was a little dirty, we had ants in our room. The shared bathroom was always had black dirt on the floor. My feet were constantly black so I had to keep washing them before sleeping. The staff were nice but didn’t speak much English at all, we had to communicate using google translate. A 30-40,000 dong ride from center. No food or drink served in hostel. Booked the hostel then hours later staff emailed informing us they had overbooked it. Don’t waste your time, you won’t have a room!